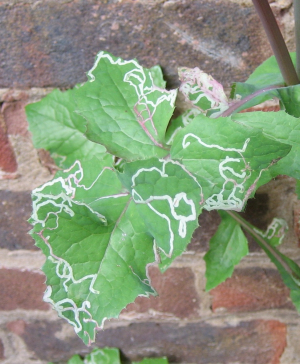 Observation - Leaf mine in leaves of sowthistle - UK and Ireland. Description: I believe these mines are made by a fly larva. They are really striking. See how the mines get broader as the larvae get older and fatter! I believe these mines are made by a fly larva. They are really striking. See how the mines get broader as the larvae get older and fatter!